Spoiler alert! If you haven’t read Fantastic Four No. 600 and you are planning to read it, please, stop reading now. NOT KIDDING! We all know that Wednesday is the best day of the week because the new comics arrive today, and this week marks a Marvel Comics event that everyone is talking about. Daniel Dean of Titan Games and Comics in Smyrna, Georgia, a behind-the-counter guy with a knack for knowing what comic book fans like to read, is focused on Marvel Comics' "Fantastic Four No. 600". Yes, I said "Fantastic Four" and not "FF". Any experienced comic book reader will probably be a little skeptical about Marvel bringing a title back for a big-number issue, Dean said, but this time it's different. If you are still reading this despite the spoiler alert at the top, now is the time to turn back if you want to remain in the dark about what Marvel has on tap. But really, if you couldn’t figure out what this issue was going to be, well, have you ever read a comic before? “Yes, the Human Torch is returning. Yes, the 'Fantastic Four' have gone back to its original title and numbering," Dean said. But, he said, those facts are like the carnival barker outside a circus big top. Hickman works a lot like a stage magician, Dean said. Much like the way magicians show the audience a flashy magic trick in order to hide the real trick, bringing Johnny Storm (a.k.a. the Human Torch) back was never the real, complete story. "What happened is the real story, and we get a doozy here,” he said. And this doozy is no flash in the pan. 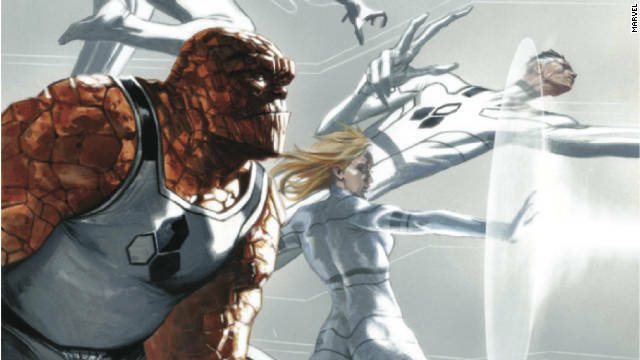 The story in this issue runs deep into the entire "Fantastic Four" universe. "The team itself, the supporting cast, the villains, the sci-fi, the Manhattan setting – there will be a ton for you to enjoy this issue,” he said. Long story short, Dean thinks this is an amazing Fantastic Four book, but apart from that this is an amazing superhero comic. Is there a comic out there that you are really loving? Let us know in the comments. We’re always looking for tips on good comics! Here are some of the comics scheduled to hit the shelves on November 23, 2011. Your local retailer will probably have these and others, so make sure to check with them for more details. Hellblazer didn't get renumbered with everything else, since it's a Vertigo book; issue #285 comes out this week. Its quality tends to vary widely by the writer. Right now, it's Peter Milligan, who can be very hit-and-miss. I really enjoyed Mike Carey's years on the book, though. Topher (or anyone else) - have you read the New 52 "Hellblazer?" It's a book I used to follow religiously (pun?) but have fallen off in recent years. Is it worth picking back up?